Glenwood Cemetery is a beautiful example of a Victorian era garden cemetery. 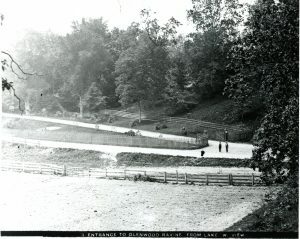 Originally opened in 1873 on about 50 acres of land, Glenwood was designed to be a place of quiet family gatherings and picnics as well as a burial ground. 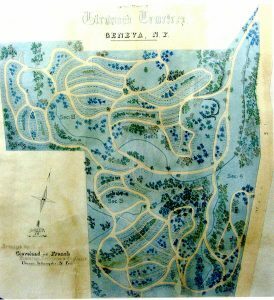 A landscape architectural drawing for the cemetery suggests it was designed by H. W. S. Cleveland, a friend of Frederick Law Olmsted who designed Central Park. Unorganized isolated burials from the first settlers to an area. Family burial plots on rural properties. Potters fields for the burials of the destitute, transient and non-religious dead. By the beginning of the 19th century, however, with the continued use of established burial grounds, particularly church yards, overcrowding became a problem. A common practice was moving bodies to make room for the newly deceased. This practice created a public health concern as people feared that moving victims of cholera, yellow fever, and other epidemics would spread disease. So began the rural or garden cemetery movement. Basically a rural cemetery was a publicly owned burial ground on the outskirts of a city or town. Rural cemeteries came in all shapes and sizes. The first was Mount Auburn Cemetery in Boston and regional examples include Mount Hope Cemetery in Rochester and Woodlawn Cemetery in Elmira. Families purchased plots and erected monuments and enclosures on their plot. The cemeteries were also landscaped to enhance their natural beauty. Fountains and ponds were added, beautiful support buildings constructed, a variety of trees, plants and flowers were planted (In fact evergreens were often selected as they symbolized everlasting life), and paths for walking and carriages were designed. What ultimately developed was the nation’s first parks. Now this is hard for us to understand today but there were no public parks or botanical gardens until the late 19th century so garden cemeteries provided a space for the general public to enjoy outdoor activities. Visitors and locals alike went to cemeteries for picnics, walks and carriage rides. To learn more about Glenwood Cemetery, joins on October 14 and October 22 for tours of the cemetery.